Preheat oven to 350º F and line two baking pans with parchment paper. In a large bowl, cream sugars and butter. Add vanilla extract, espresso powder, sour cream, and egg, and beat until well combined. In a separate bowl, stir flour and soda together. In two or three parts, add dry to wet, stirring constantly. Once batter is complete, refrigerate for about 15 minutes. With a soup spoon, drops small scoops of dough, about two inches apart, onto prepared baking pan. Lightly press a dark chocolate Hershey’s Kiss into the center of each scoop (see above). 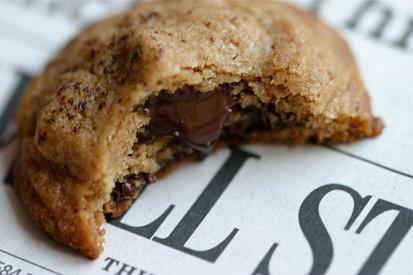 Cover with another small scoop of dough and seal each kiss into center of cookie. Make sure no part of the Kiss is visible in each cookie ball! Sprinkle each cookie with a little espresso powder and place on upper middle rack in oven. Bake for about 10 minutes, until edges are beginning to turn golden brown. Cool for about ten minutes, and enjoy! Note: Best eaten while hot…while the chocolate center will flow out, onto your tongue, with every bite.